50 bags, 14" x 16"
Go green the easy way with this convenient countertop composter. Beautiful ceramic crock not only looks good, but is also great for your garden and the environment. Simply toss in organic scraps like coffee grounds, eggshells, vegetables or clippings. Features a filtered lid for odorless storage. A sturdy, stainless steel handle makes adding scraps to your compost pile easy. Crock measures 11.5in. x 9in. and holds 2 lbs. Crock, bags and replacement filters are sold separately. 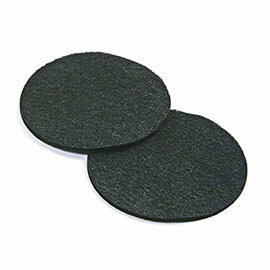 Compost Crock Replacement Filters are available in a 2-pack and last up to six months each. 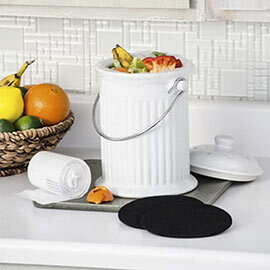 Degradable Compost Bags are made to line the inside of the crock for easy cleaning. When the bag is full, simply toss it in your compost bin. Bags are 100 percent degradable and include 50 per package.